Nicholas is a Speech and Language Therapist who graduated from The University of Sydney, Australia in 1999 with a BAppSc in Speech Pathology. He worked as a Speech and Language Therapist both in Australia and UK with a keen interest in working with people with neurological conditions particularly, traumatic brain injury (TBI). He completed a research masters degree focused on the effectiveness of communication partner training for paid carers of people with TBI. 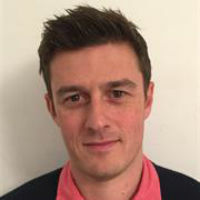 Currently, his PhD is focused on investigating the effect of project-based treatment for improving communication skills and quality of life in people with acquired brain injury (ABI). His research interests lie in understanding the nature of communication problems following a brain injury, approaches to the remediation of these problems and how to measure changes in communicative ability and quality of life post-treatment. He also has interest in defining complex behavioural treatments, proving fidelity of treatments and goal-setting including, the use of accessible technology and videotaping in the goal-setting process. Nicholas lectures on brain injury at both Essex and City University, been involved in policy development through the Royal College of Speech and Language Therapists and has given regular talks to practicing therapists on the assessment and management of people with brain injury. He is a research affiliate of both the Centre of Clinical Research Excellence in Aphasia (CCRE) and Centre of Research Excellence in Brain Recovery (CRE) and is the UK student ambassador to the Australasian Society for the Study of Brain Impairment (ASSBI). MAppSc (Communication Science and Disorders), The University of Sydney, Australia, 2012. Thesis title "communication training for paid caregivers of people with traumatic brain injury (TBI)"
Nicholas' core research interests relate to communication problems following acquired brain injury (ABI) and approaches to their remediation. Previously, Nicholas has been involved in evaluating the effectiveness of TBIExpress, a treatment manual created in Australia to help improve the communication skills of people with ABI and their communication partners. More recently, he has become more interested in examining treatment approaches for improving communication skills and quality of life in people with ABI. These approaches have often led to cross-discipline collaborations with Occupational Therapy and Psychology. 2015-2016 Behn, N. School of Health Sciences PhD Progress Award City University London, London UK, £9,750. 2015 Behn, N. School of Health Sciences City University London travel grant, London UK, £1,000. 2015 Behn, N. Moving Ahead NH&MRC Centre for Research Excellence Small Seed Grant. Sydney, Australia. http://www.moving-ahead.com.au, £1,000. 2012-2015 Behn, N. PhD Scholarship for City University London from The Worshipful Company of Saddlers, London UK, £59,500. 2012 Behn, N. British Aphasiology Society Conference Grant, UK, £250. 2011 Behn, N. Postgraduate research funding grant for MAppSc Research. The University of Sydney, Australia, £900. 2009-2010 Behn, N. Faculty funding grants for MAppSc Research. The University of Sydney, Australia, £1,500. 2008 Behn, N. AAC Technology from the Brain Injury Rehabilitation Trust, Ely, Cambridgeshire, UK, £2,500. 2002-2003 Behn, N., & Moorhouse, K. AAC Technology for Liverpool Brain Injury Rehabilitation Unit from the Motor Accidents Authority, NSW, Australia, £7,500. Behn, N., Marshall, J., Togher, L. and Cruice, M. (2019). Feasibility and initial efficacy of project-based treatment for people with ABI. International Journal of Language and Communication Disorders. doi:10.1111/1460-6984.12452 . Behn, N., Togher, L. and Power, E. (2015). Experiences from a communication training programme of paid carers in a residential rehabilitation centre for people with traumatic brain injury. Brain Injury, 29(13-14), pp. 1554–1560. doi:10.3109/02699052.2015.1077992 . Behn, N., Togher, L., Power, E. and Heard, R. (2012). Evaluating communication training for paid carers of people with traumatic brain injury. Brain Injury, 26(13-14), pp. 1702–1715. doi:10.3109/02699052.2012.722258 . Behn, N., Cruice, M., Marshall, J., & Togher, L. (2015). Making use of goal attainment scaling (GAS) to improve communication skills following project-based treatment for people with acquired brain injury (ABI). Sydney, Australia (2015). Description: The 5th International Neuropsychological Society/Australasian Society for the Study of Brain Impairment (INS/ASSBI) Pacific Rim Conference, Poster presentation. Behn, N., Cruice, M., Marshall, J., & Togher, L. (2015). Improving the fidelity of behavioural treatments for people with brain injury: Describing the process for project-based treatment. Sydney, Australia. (2015). Behn, N. (2015). Improving communication skills and quality of life for people with ABI following project-based treatment. Sydney, Australia. (2015). Description: Postdoctoral and Postgraduate Research Symposium, Oral presentation. Behn, N. (2014). Use of video-taping and projects for building awareness. Manchester, UK (2014). Description: Occupational Therapy Neurological Rehabilitation Day, Invited speaker. Behn, N., Cruice, M., Marshall, J., & Togher, L. (2014). Treatment definition and fidelity of a flexible and individualised treatment for people with acquired brain injury (ABI). Limassol, Cyprus (2014). Description: The 11th Conference of the Neuropsychological Rehabilitation Special Interest Group of the World Federation for NeuroRehabilitation (WFNR), Poster presentation. Behn, N., Cruice, M., Marshall, J., & Togher, L. (2014). Subjective quality of life measurement in post-acute brain injury treatment studies: A review of the literature. Limassol, Cyprus (2014). Description: The 11th Conference of the Neuropsychological Rehabilitation Special Interest Group of the World Federation for NeuroRehabilitation (WFNR), Datablitz presentation. Behn, N. (2013). Use of video-taping and projects for building awareness. London, UK. (2013). Behn, N. (2013). Outcomes in brain injury treatments: A focused literature review on quality of life. London, UK (2013). Description: Brain Injury Rehabilitation Trust’s Biennial International Conference, Invited speaker.